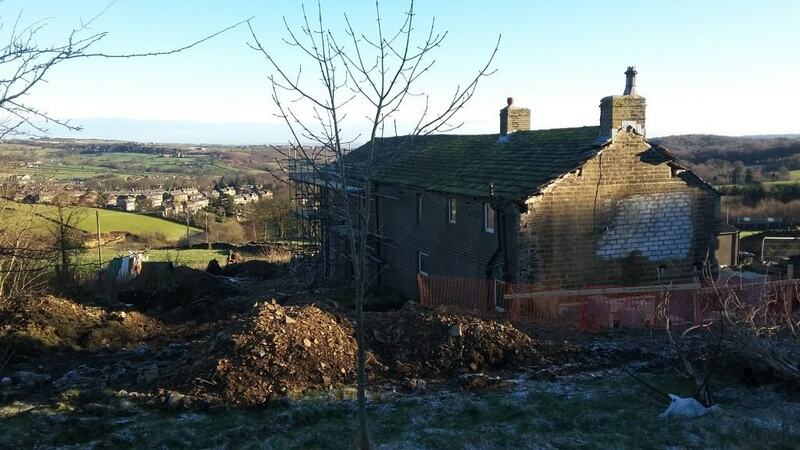 We are a bit behind with our blogging as our building team is already well underway with our newest radical retrofit of a Victorian farmhouse and barn conversion in the Peak District National Park, West Yorkshire. The farmhouse has been relatively unimproved since the 1940s and so needing extensive refurbishment including re-roofing. The garden room is to be connected to the farmhouse and is being built on the site of the former tractor shed. The construction will follow much of the cavity wall detailing as used at our Denby Dale and Golcar Passivhaus projects. The attached Victorian barn was re-built in 2002 reusing the Yorkshire sandstone walling to reconstruct as original. The walls are 450mm wide with inner and outer coursed stonework, a rubble-filled cavity and occasional ‘through’ stones. The mortar used looks like it is a weak mixture of lime and cement with course sand. The roof was re-done at the same time with an open, breathable membrane under the reused Yorkshire stone slates, which has meant that we haven’t needed to replace the barn roof. The retrofit is complicated by the fact that there was a fire at the property in the 1940s and there is evidence of charring of the trusses in the barn. It looks like a large part of the farmhouse was completely gutted because the intermediate floor and the roof is from a more modern era (probably mid 20th century) . The clients came to us two years ago having learned about what we were doing at the Cumberworth radical retrofit project and wanted to apply the same principles to their home. The project had already been designed by Natalie Garside at ADP architects in Holmfirth for planning permission, so again we were working with existing outline designs . We are employing a whole house strategy similar to Cumberworth project but this time we are working with more of blank canvas as the building has effectively been gutted. As at Cumberworth, we are working towards CarbonLite retrofit standard but not going as far as EnerPHit. We’ve done quite a lot on the farmhouse already and we’re well on with the barn and have actually demolished the tractor shed and put the foundations for the garden room in place. In the next blog we’ll look at what we are doing with internal wall insulation ( IWI ) on the project.